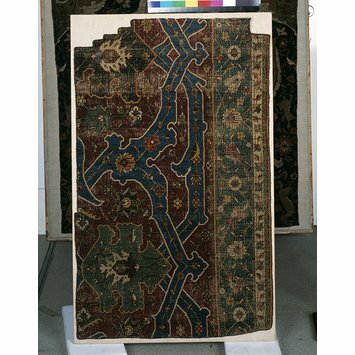 END FINISH: upper: cut and oversewn at later date; lower: cut. DESIGN: The main border is incomplete in width; dark red ground with two wide strapwork 'layers' one on top of the other; in blue edge with white infilled with blossoms and small flowers on thin yellow stems. One incomplete plamette in green edged with yellow, another partial palmette in dark blue. Underlying the strapwork is a narrow green stem carrying flowers and leaves. Outer border: green ground with red meander bearing tulip-shaped flowers, over a fine yellow broken double meander bearing two types of white blossom and buds. Outermost border: white ground with angular red meander and multi-coloured flowers, to the outside of which is a band of curvilinear S and Z motifs in dark green and red. Purchased from an Istanbul source.